Information provided here describes about documents required by each import in Japan which need to be submitted with customs officials for the clearance process. What is the certification process to import to Japan? 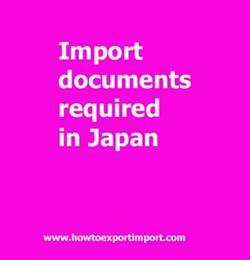 What are the documentation procedures as an importer in Japan? Types of documents required in Japan to import goods? In many cases, the documentation may also vary depending on the country of origin or destination. Thus, documents may have to be prepared in a particular way to comply with the requirements of the import or export country. The documents required for import to Japan to take delivery of import cargo is based on the product importing, multilateral, bilateral or unilateral trade agreements, and other trade policies of Japan government. The import documents required in Japan also depends up on the nature of goods importing (General goods, Personal effects, Dangerous goods, Livestock etc.) ,regular trade policy of Japan Government, specific goods importing to Japan (Arms and ammunition, health products, food products, chemicals etc.). . Understanding the right export documents is essential for smooth import and export procedures. The Japanese Measurement Law requires that every single imported item and shipping documents demonstrate metric weights and measures. As indicated by the Japanese law, labelling of products in numerous classifications is fundamental. Marking, labelling and correct packing of your items is critical for gathering all the Japan import documentation. Japanese law requires labels for textile materials, electrical machines and apparatus, plastic items and other family and consumer products. Labelling the products is vital when selling the imported products, that is, labelling is not normally necessary at the customs clearance stage. This post explains about various documents that every importer need to be submitted with the Japan Customs Authority in order to obtain clearance of the consignment. Import documentation in CHIBA port customs. What are the documents required to import in HACHINOHE . What are the import document processes need to carried out with HAKATA customs. Required documents to import in SHIMIZU port. Customs documentation requirements to import at HITACHI port. Documents required to submit with KINAWA customs for importation. Documentation procedures for import at IWAKI customs. What are the documents need to be submitted to import at NIIGATA O port customs. Which documents should I provide at OSAKA customs port location for import. Documents need to move cargo out of customs at SAKAI port customs location. How to Import to Grenada? How to import to India from Uganda? How to Import to Uganda? How to import to India from Dominica? How to fill application for GSTIN (Goods and Service Tax Identification Number)?